Embark on the adventure to the deep jungles inhabited by a dangerous Bengal Tiger that roams around and hunts for other animals. Your trek will not be long and hard, since the Untamed: Bengal Tiger video slot is here to immerse you into the challenging virtual tour. The Microgaming-powered slot has some unique branded features like Collect a Wild or a Lucky Nudge to give you the most memorable gambling experience. 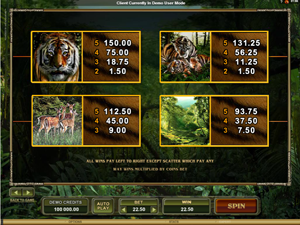 Untamed: Bengal Tiger is a five-reel slot with 243 ways to win. This means that a winning combination is created when a few matching symbols land on adjacent reels starting from the leftmost reel, without sticking to a fixed line pattern. In the controls panel you can adjust a bet value before you spin the reels online casino for real money. A coin size is available in three options: $0.01, $0.02 and $0.05, with up to 15 coins per spin. So the floor and top wagers are $0.3 and $22.5 per spin, respectively. There is an Autoplay button that shows a popup menu on a click and allows for customizing the automatic play settings. The symbols in the slot are a Bengal tiger, a couple of Bengal tigers, fallow deer and forest sceneries – all designed in a photorealistic way. The nature symbols are supplemented by high playing cards from 10 through ace. The card icons are the lowest-paying symbols awarding x2 to x100 times a bet for 3 to 5 of a kind. The highest prize the regular symbols can award amounts to x200 times a line bet, for five Bengal Tiger icons landed on an active payline. The slot’s logo represents a wild symbol that substitutes for all icons except scatters. Besides, there are wild progress bars under each reel. Whenever a wild symbol lands on a reel, a small badge is added to the progress bar for that reel. When the meter for a certain reel gets filled up with four badges, the entire reel becomes wild for the subsequent four spins, thus boosting your winning opportunities. The Tiger’s Eye serves as a scatter, with these 3 or more scattered across the board activating 20 free games that cannot be retriggered. The scatter pays out the first jackpot worth x3000 times a total bet. If you rolled up two scatters and one misses to start a free spin round, you can benefit from the Lucky Nudge feature. Some Tiger’s Eye symbols may appear a bit under or above the reel border, but they are nudged down into place to give you three “full” scatters and trigger free spins. During the free spin round, the Trailing Wilds feature can be activated. Any time a wild symbol helps create a winning combination, that wild moves one position down, and another wild appears on its place, which gives you 2 wilds for a subsequent spin. Many slots out there are equipped with an embedded gambling feature designed traditionally as a “guess a card color/suit” game. Untamed: Bengal Tiger is a notably rare exception enabling you to manage your odds. In the Gamble feature, you’ll see a “globe” divided into Win and Lose sectors and having an arrow inside. Before you start gambling, you should tune the size of the Win sector. Increasing the Win sector, you get better winning chances, but a smaller money award. Decreasing the Win sector, you get less winning chances, but a bigger money award. 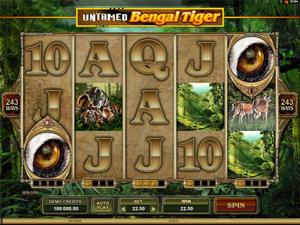 The Untamed: Bengal Tiger nature-themed slot developed by Microgaming will appeal to no-payline slot enthusiasts. Offering a pack of unique features, the game has a x3000 jackpot and lots of money-grabbing opportunities, including a customizable Gamble feature.